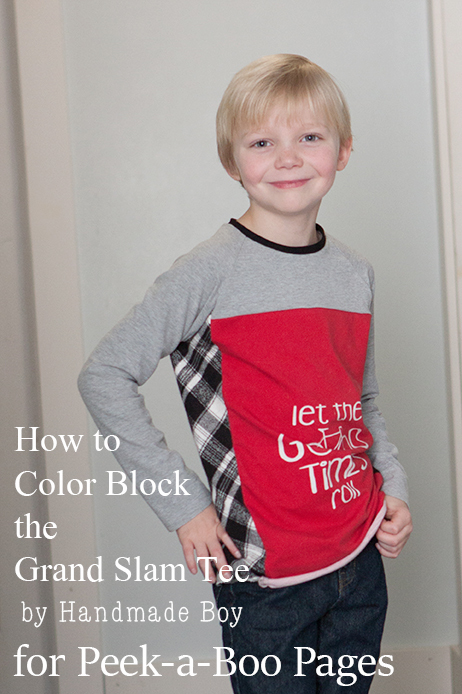 Color Blocking the Grand Slam - Peek-a-Boo Pages - Patterns, Fabric & More! Hello Peek-a-Boo readers! 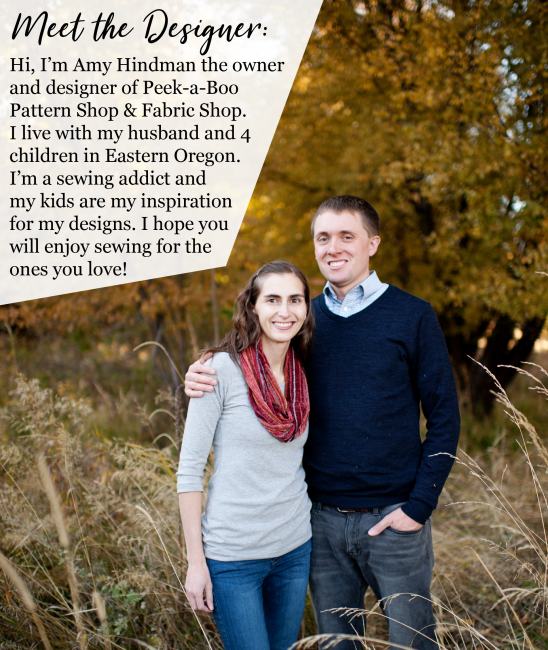 It’s Kelly from Handmade Boy and I’m here today to share with you how you can use those awesome panels for the Grand Slam, even if they are a bit too small for the pattern. My son wears a size 7 in Peek-a-Boo patterns now. The problem is, that I have those great panels I bought when he was younger and in a smaller size. But now, the panel isn’t big enough to use for the front of his shirts! So the answer is to color block the Grand Slam! It’s so simple and gives the Grand Slam an entirely new look. First, you are going to need to square off your panel. Then fold it in half and compare it to the front piece of the pattern. I marked the size of the panel on my pattern piece in pink pen. Then determine where you want the color blocking to be. Remember to allow for seam allowances! 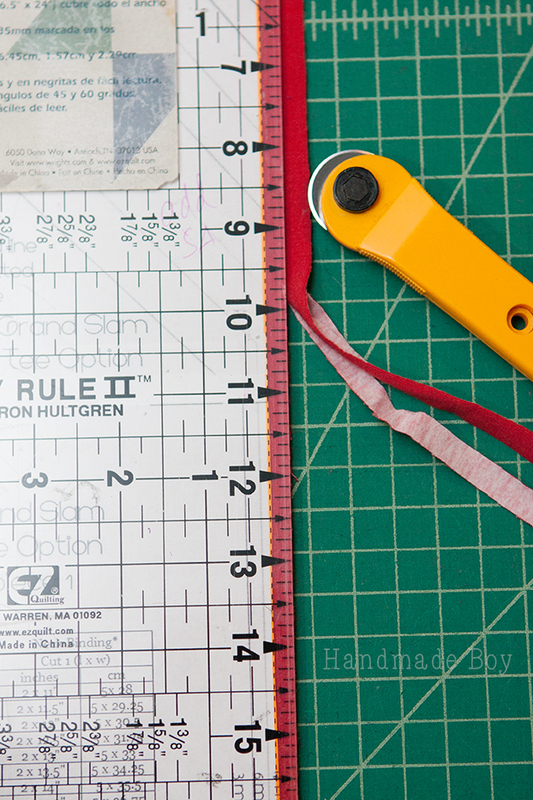 I am going to cut my pattern pieces to create the color blocking pieces on the orange marker lines. Now I have my new pieces! Easy right. 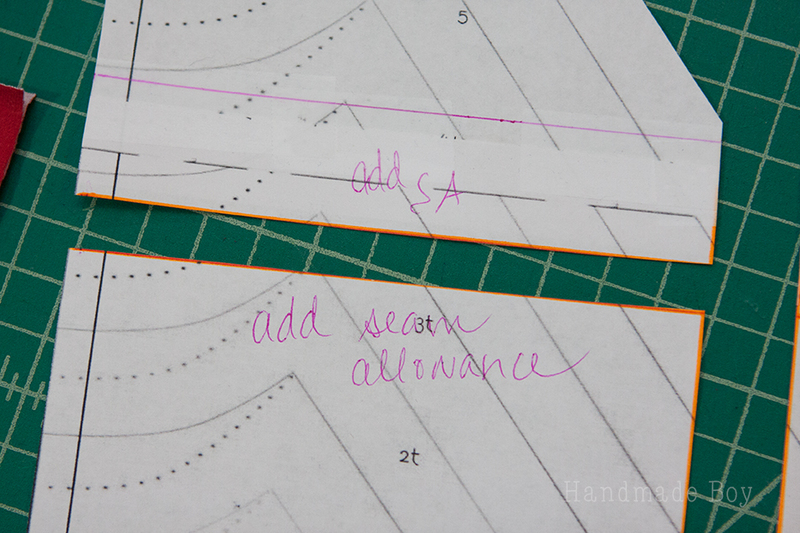 I like to mark along each edge, a little reminder to add seam allowances in when I cut my fabric. 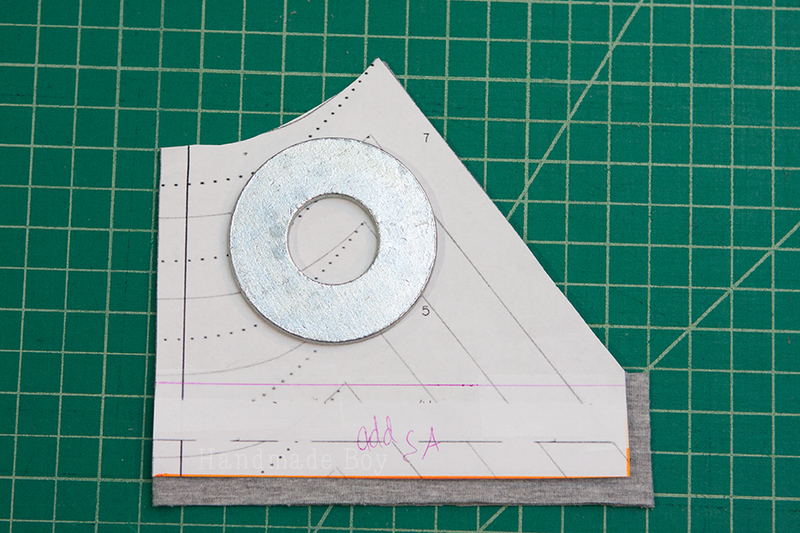 Be sure to add your seam allowances to all sides of the top front piece you created. For the side, I wanted to create a side panel, instead of just a basic color blocked front. So, I cut it out with the original side seam on the fold of my fabric. You will need to cut two of these. You are able to use a woven fabric for these side panel pieces! I used flannel for mine. 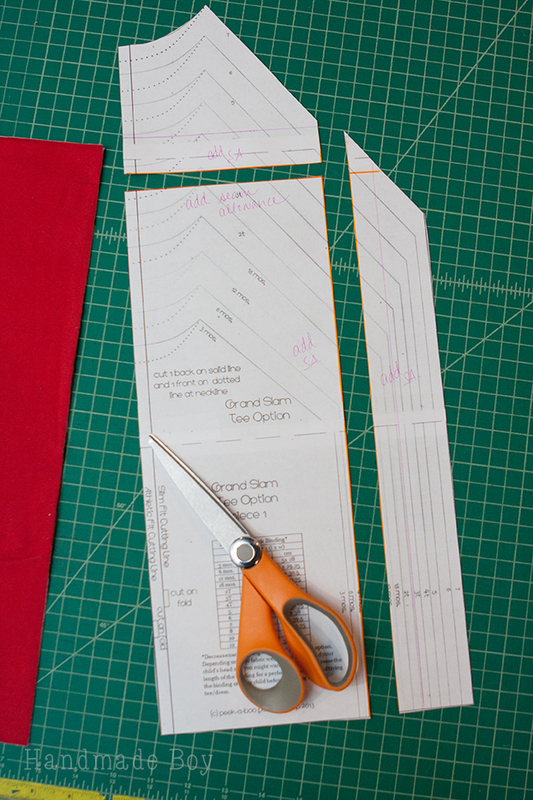 Also, you will need to remove the 1/2 seam allowance on the original side seam, if you cut your piece on the fold. 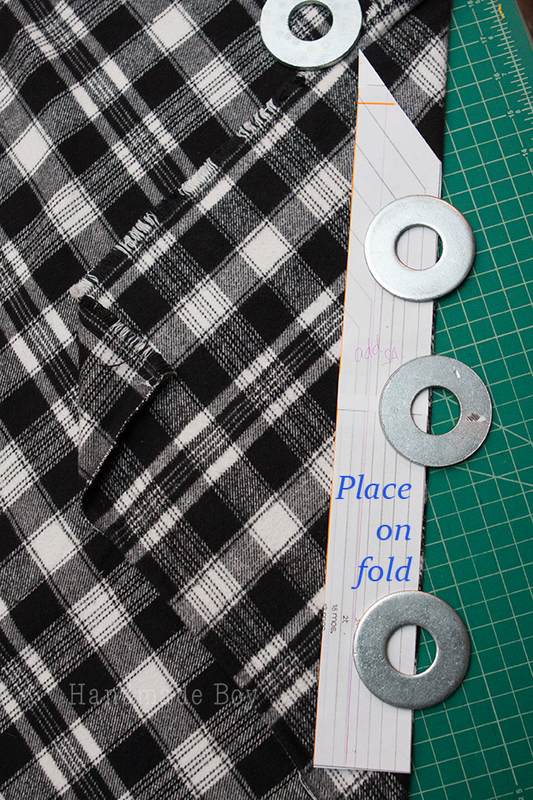 Just fold back the pattern piece 1/2″ inch to do this. Here are your new pieces all cut and ready to go! To cut your back piece, just tape the top and bottom front pieces back together and cut on the fold. Do no add in the side piece since we created the side panel. You may notice also in these photos that my pieces extend past the bottom of the pattern pieces. My kid is tall. He needs an inch added to the shirt’s length. Crazy tall kid. Now that your pieces are cut, we are going to assemble the color blocking! Sew the top and bottom pieces together right sides together. Press the seam down and topstitch if desired. 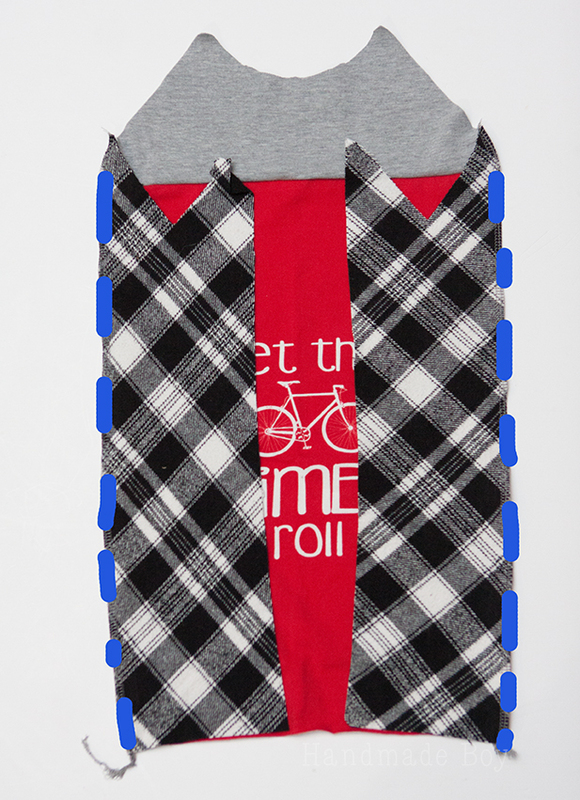 Attach the side panels to the front of the shirt, right sides together. 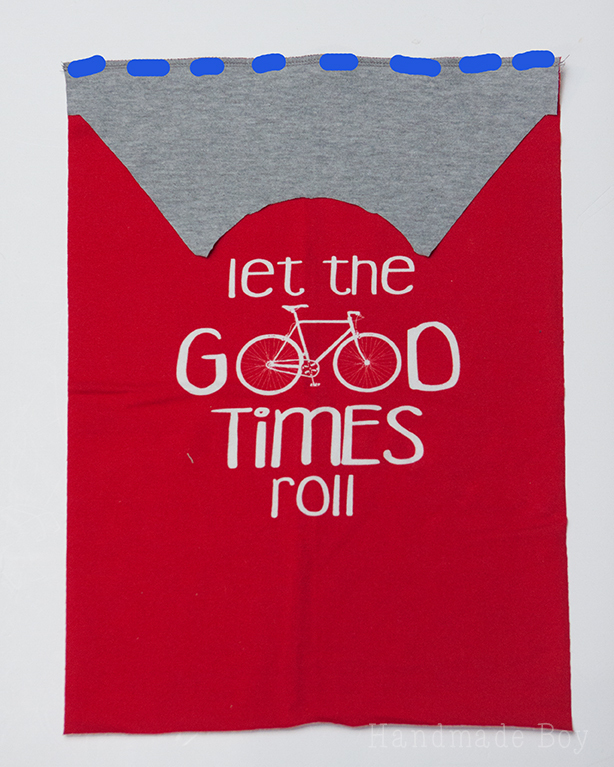 Press the seams towards the front of the shirt. Topstitch if desired. Attach the back to both side panels. Press seams towards the back. Topstitch if desired. Now it’s time to attach the sleeves. Sew the seam of the sleeve right sides together. Turn sleeves right side out. Now with the shirt still wrong side out, match up the sleeve to the body of the shirt right sides together. 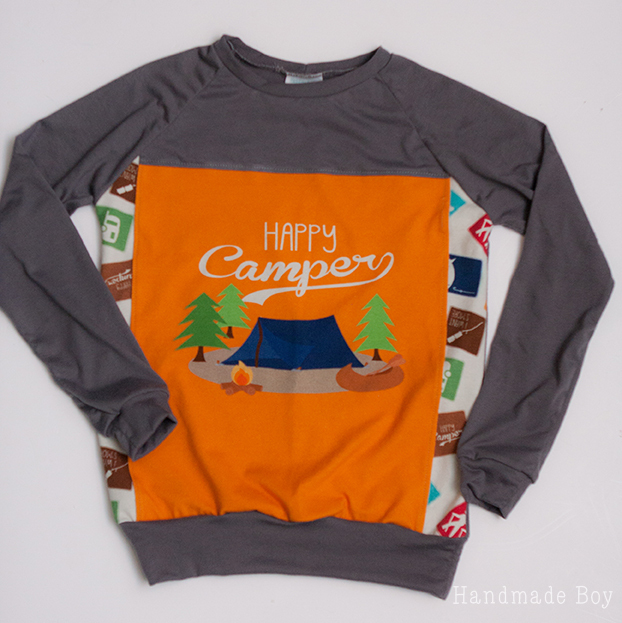 The seam of the sleeve will line up with the V in the side panel. 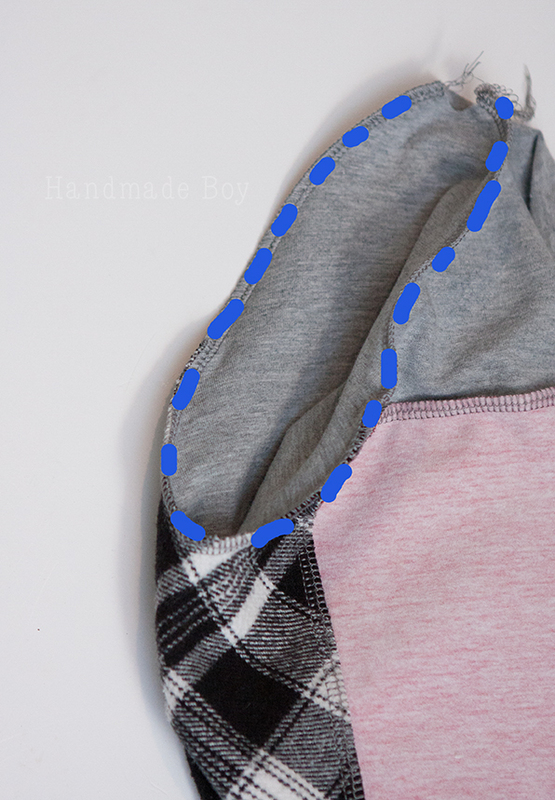 Line up the ends and sew the sleeve into place with one continuous U shape. Don’t sew across the top of the neck hole. Just attach the sleeve. 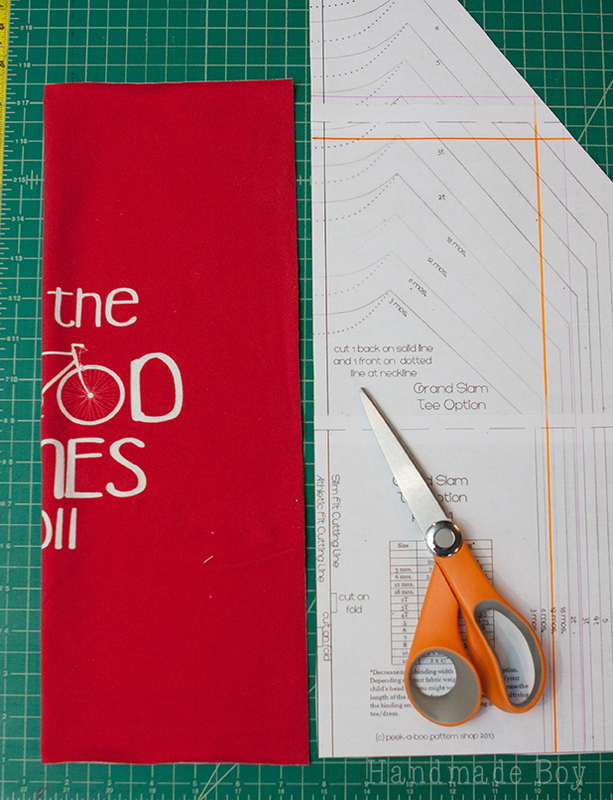 Now, follow the rest of the grand slam pattern to attach the neckband and hem the bottom and sleeves. Now you have a fun way to color block your Grand Slam! Now, we can color block another way. 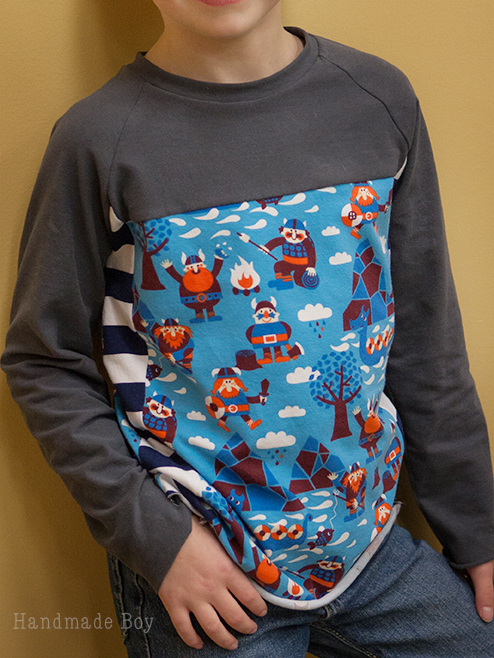 Say your panel is a bit short, but you don’t want to make the top portion larger or you just want to keep the design of the panel higher up on the shirt and not so much on the belly. How about adding a band at the bottom of the shirt to solve this! You will follow all the same steps in squaring off the panel and creating the pattern pieces. The panel piece, front side pieces and back piece are all cut 1.5″ short so we can add the band and not have the shirt be too long. This time, I didn’t cut the side pieces on the fold to create side panels. They will just appear on the front of the shirt. Because of that, when you cut your back piece, you will need to add the side pieces back in place. (Or just cut your back piece before you cut up your pattern piece.) 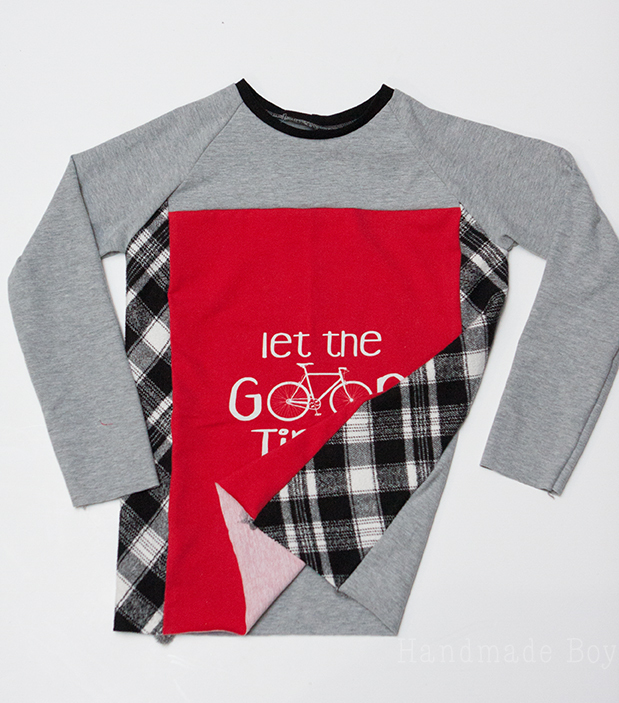 Assemble the front of the shirt in the same way we did above. 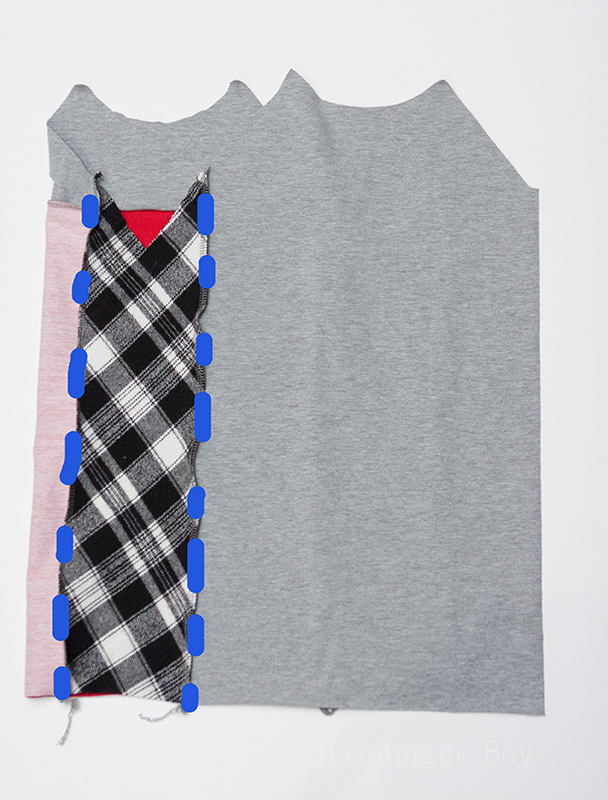 Assemble the rest of the shirt as instructed in the pattern. 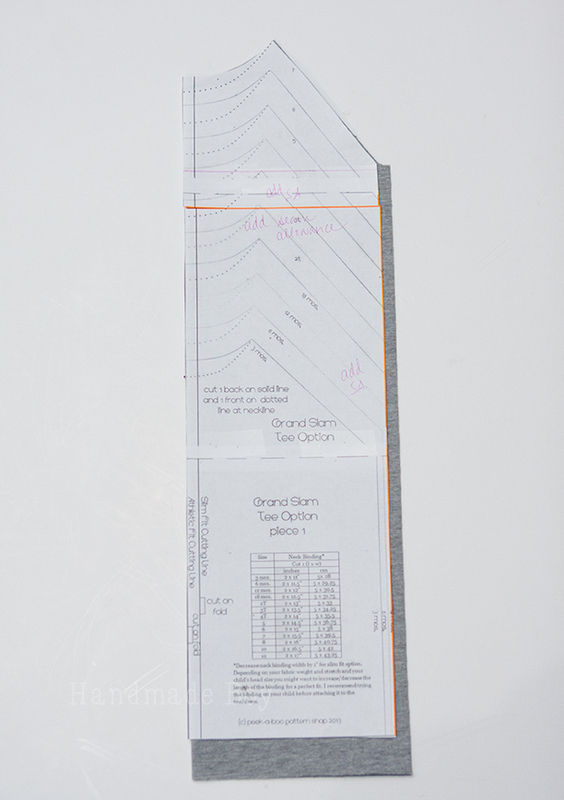 To create the band at the bottom, measure the width of the bottom hem of the shirt laying flat, and then multiply by 2. 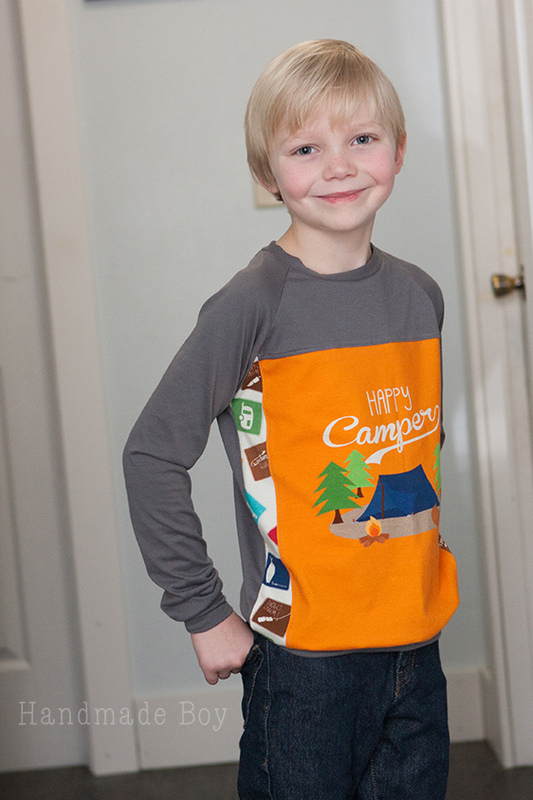 In this case, the bottom hem is 14.5″ x 2 = 29″ for the total length of the hem. Multiply this number by 80% to get your band length. 29 x .80 = 23.2 We can round down to 23″. 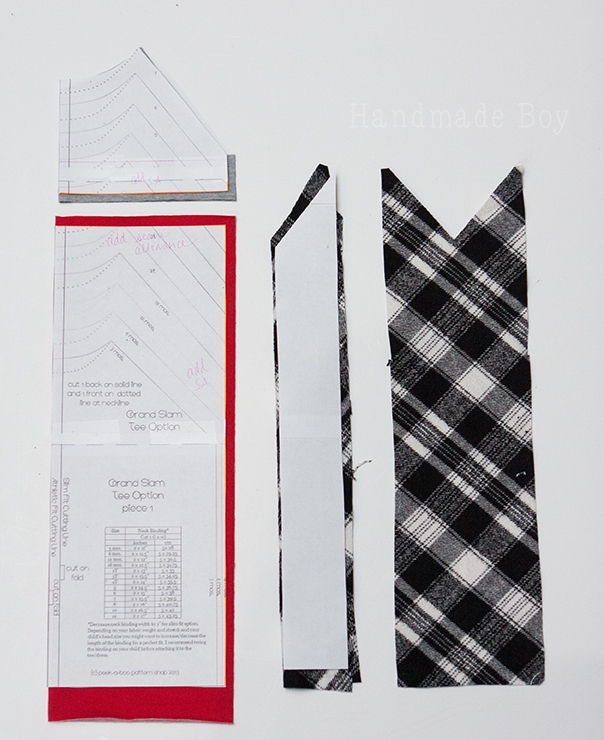 I needed to add about 3″ to my shirt (adding back in the 1.5″ from the panel being cut short and adding 1.5″ for my son’s height) so my band needs a width of 6″ (3″ for each side of the band) plus seam allowance (again, I like 1/4″) so my final band width is 6.5″. My final band measurements are 6.5″ x 23″. Attach the bottom band the same way you do the neckband. As you can see in the photo of the shirt above, I also added cuffs to the sleeves. Do this in the same manor as the bottom band if you like. Coloring blocking the Grand Slam is also a great way to stretch your precious custom and Euro fabrics as far as possible! Or, if you only have a fat half and your fabric isn’t tall enough, color block! 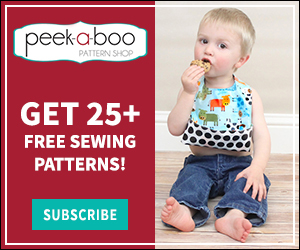 I love all the different looks I was able to create with this simple pattern hack!